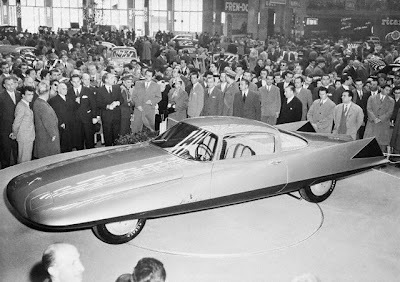 Turin, Italy 1955 : A feeling of speed is brought out in the long, sleek super-luxury car called "Gilda," displayed at the 37th automobile show in Turin. Complete except for engine, the car, created by Ghia, seemed to be the last word in streamlining those days. Some 450 exhibitions from 14 nations displayed their automotive products at the show.